The latest in technology for busy advisors. Keeping track of your social media accounts can be a job unto itself — one that eats up too much of your time. But it just got a little easier, thanks to Buffer, software that streamlines your social media management process. Buffer lets you decide where and when you want to post updates, photos and other information across social media sites, placing them in an easily edited queue. It’s compatible with favorites such as Facebook, Twitter, Google Plus, Instagram and LinkedIn, and provides analytics so you can make sure your posts get out to the maximum number of people possible. Individual plans range from free to $10 a month, while business plans start at $100, buffer.com. Stay organized even in a cramped airplane seat with the help of the Airpocket, a bag that helps keep your travel essentials in order and fits in your seat-back pocket, so you don’t have to open the overhead bin to get to your tablet or boarding pass. The flexible neoprene pouch comfortably holds and protects technology, and has an adjustable shoulder strap. $60, airpocket.com.au. Anyone who’s ever lost their keys or wallet —and wasted valuable time searching for them —will fall for Pixie, an app that turns your iPhone into a smart location system with the help of handy adhesive markers called Pixie Points. 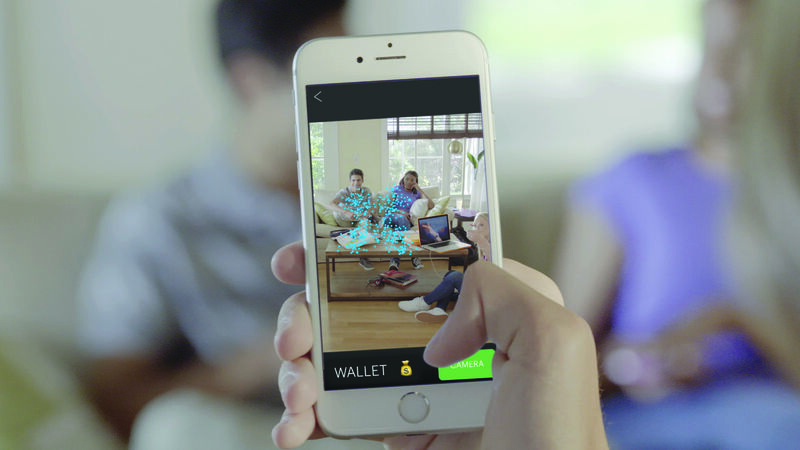 Pixie uses an augmented reality feature to help find lost items (up to eight), with an accuracy of just inches. It even can see through walls! If your iPhone itself is the thing you can’t seem to keep track of, Pixie can find that, too, even if it’s turned off. And when items are out of range it will let you know where it was last seen, so you can retrace your steps. $50 and up, getpixie.com. In case you thought we had reached total saturation when it comes to “smart” products, check out GeniCan. This device, which is powered by AA batteries, attaches to garbage cans or recycling bins and allows you to add items to your grocery list automatically, just by disposing of them. GeniCan reads UPC and EAN codes, then puts them on your smartphone’s grocery list via the app. Items must be intentionally swiped or entered by voice, so you won’t end up purchasing whatever impulse buy got the best of you last time. It’s also compatible with Amazon Dash Replenishment, so you can skip the supermarket entirely and have your groceries delivered to your door. $150, genican.com. Forget those comical attempts to squeeze too much in your suitcase. Grand Trunk’s Compression Pack Cubes help you make the most of your limited space with the assistance of compression straps and expansion zippers. The bags squash items down to half their size. The nylon bags come in three neutral colors and range in size from the Weekender to the Explorer, so you can choose one based on the length of your trip and size of your suitcase. $60–$100, grandtrunk.com. When you’re on the go, you can never be completely sure about the air or water quality at your destination. That is until the advent of two handy products that let you know what’s safe to drink or breathe. The Lifesaver bottle holds up to 750 milliliters of water and uses ultra filtration technology to filter out viruses, bacteria and parasites, eliminating the need for — and nasty taste of — chlorine. Its filters last up to three years and up to 6,000 liters. $150, iconlifesaver.eu. Wair neck tubes look like fashionable scarves, but they’re actually the world’s first anti-pollution scarves. The material acts as an air filter, keeping out the tiniest particles of dangerous gases, pollen and other irritants. The recycled polyester scarves come in three colors and are designed for men and women. Still wondering about the air quality where you are? The Supairman app gives the pollution count and gives tips on when the Wair is of most use. $60, wair.fr. The U.S. Customs line is one of the most-dreaded spots in an airport. But you can now zip through Customs at 22 airports (and one cruise port) with the help of Mobile Passport. The app, which is officially authorized by U.S. Customs and Border Protection, lets you set up a profile that can be saved and updated for subsequent trips. Then once you’re at the airport, you just follow the Mobile Passport Control signs, show your passport, scan the barcode and head out. Sign up for updates on the website to find out which airport will get the service next. Free, mobilepassport.us.